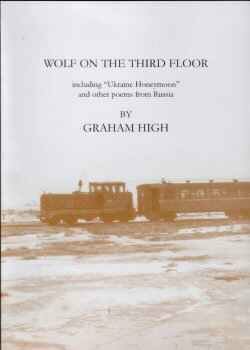 GRAHAM HIGH: WOLF ON THE THIRD FLOOR. is Graham High's fourth collection of poetry. "Poems from Russia" including the 19-section "Ukraine Honeymoon": Our unsure love is a corridor/ rattling through history; our uncertain/ destiny. Great. NEGATIVE/NOT NEGATIVE is one of the best poems in the booklet. Mr. High has a cold fascination with Russia as shown in some of these lines — The grey light seeps into one's bones, — The sky glares down like a constant question. — The comparison of rooks and stars is well observed, but the last three lines sum up the poem beautifully — ..The Russians are a grey people,// living in the thin penumbra... — As a whole, WOLF ON THE THIRD FLOOR is an accomplished body of work, with certain lines that ring and echo in one's head. Each poem reveals a little more of itself at every reading. There is the added interest of Mr. High's introspective views of Russia — a land strange and forbidding to most of us. It is a startling collection on an unfamiliar theme. Laura Sheridan (editor of Pennine Ink). This is poetry of remarkable quality, enriched with metaphorical detail and assonant balance of word and phrase; cadence is appropriately linked to change of mood and situation. There is lyricism in Graham High's poetry, whether in rhyming stanzas or in those poems which adhere to no particular verse-form, and I most readily and unreservedly give this fine publication the thumbs-up. It is a truly commendable collection. Reach (Bernard M Jackson). contains some very graphic descriptions of contemporary Russia. The landscapes on train journeys especially are caught vividly, but there is also poignant social comment. The Poetry Church (John Waddington-Feather). Beautifully produced as one would expect from NHI. ... Exceptional imagery and a fine economy of words ... A collection I'm happy to own. CPR International (Tom Lewis). High is quite capable of understanding a foreign consciousness, and rendering it in verse — not an easy task. I'll be on the lookout for more from Graham High in the future. Pulsar (Blair Ewing). Although cold to touch, many of the poems transcend the narrative, revealing the warm undercurrent of the poet's affections, like the excellent 11 page UKRAINE HONEYMOON where the newley-weds leave Moscow by train. "Filigree silver round the glass/ chatters your teeth as we take tea/ in the wind, watching the suburbs pass/ The vodka-sodden guard smelling of piss/ peered down your blouse as he gushed hot water/ from the samovar with lascivious hiss". and we follow them all the way as they struggle with ghosts of the past and temptations of the present as they rattle through fabulous landscapes that sing and come alive with the poet's deft touch. A gem of a read. The Affectionate Punch (Andrew Tutty). This collection combines elements of a good travel book with a mysterious hint of LeCarre. Other Poetry (Jo Colley). an exceptional collection of poems, each one a little gem in itself, but like a song cycle taking us on a journey... No review can do full justice to the high quality and absorbing content of this book. No one who risks their £4.50 will be disappointed - like me you will want to read it again and again - for each time new pleasures will be discovered. Poetry Monthly (John S Mercer). High's work is honest, intelligent, and tender. He loves and is intimidated by the hard-bitten Russia he evokes so feelingly in these formidable poems. Iota (Tony Grist). There is much beauty and intelligence in this poetry. I found myself wondering if Graham High could have any Russian ancestry, since there is a feel in some of the work of Osip Mandelstam and of that indefinable sense inadequately describable as a "Russian soul". The depth and subtlety in this collection is satisfying. Weyfarers (Stella Stocker). I enjoyed the leisurely pace and the stark uncluttered phrasing. Krax (Andy Robson). This page last updated: 22nd February 2009.